You Can Be a Miracle in someone's life. Help our Native Americans by donating to the Southwest Indian Foundation. 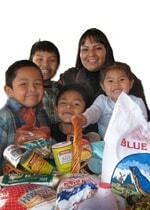 Where All Your Purchases Help the "Poorest of the Poor"
Southwest Indian Foundation is celebrating 50 YEARS of service. We are very proud of the much-needed help we have provided for Native Americans housing, emergency food, education and more. We could not have done this without all of YOU every step of the way! © 2019 Southwest Indian Foundation. Southwest Indian Foundation is a non-profit organization. All donations are 100% tax deductible and 65% of the cost of all purchases are tax deductible. Southwest Indian Foundation is a non-profit organization. 65% of the cost of all purchases are tax deductible.